Every girl has one, a teen idol. The guy you wallpapered your teenage wall with posters of, the guy you bought every album of and would run out to buy every magazine he was in. Mine was a makeup wearing, leather loving, spiked hair, heavy metal bass player called Nikki Sixx. He was also the first guest speaker to kick off "Canadian Music Week" at the Royal York hotel this year. I have been lucky enough to see him live in concert a few times, something I didn't even dream about growing up in small town Nova Scotia. I've also met him 3 times; First time when I was 30 at an in-store record signing. I was so nervous I almost left after waiting over two hours in line. Afterwards, I literally floated up Yonge Street with my signed poster and a Nikki kissed hand! 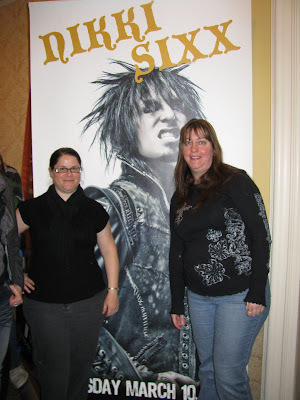 Second time was at a VIP Hard Rock party in Orlando, Florida in 2003 that my friend had won tickets too, and took me! (I outta do a whole blog on that weekend!) This was by far the best meeting, as I actually got to spend some time talking with him. 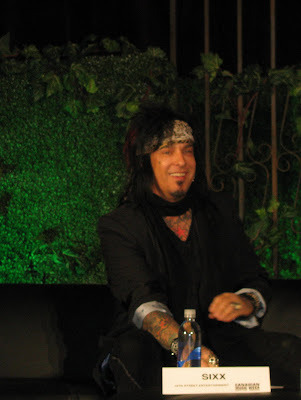 Third time was at an in-store book signing in September, 2007 for his book, "The Heroin Diaries", and nerves got the best of me again, and I don't even remember what I rambled on about when it was my turn to have my book signed. 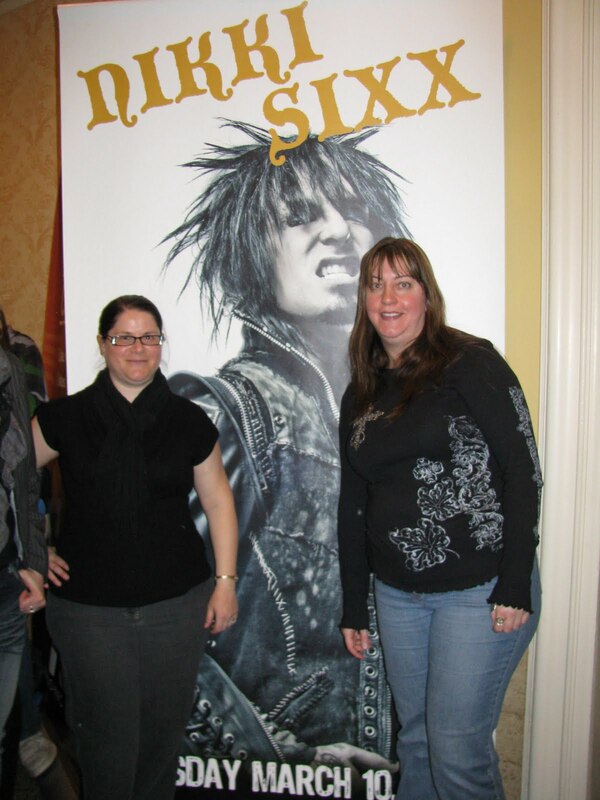 Jenn and I waiting in line to hear the interview with Nikki Sixx. 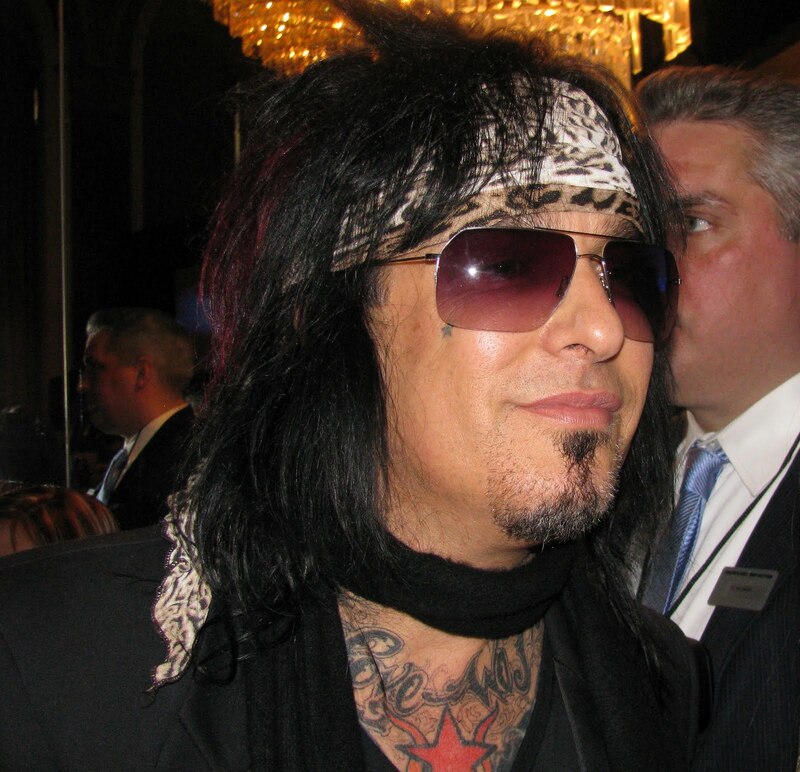 I think I was 13 when I discovered Nikki and Motley Crue. An awkward time in a girls life, and I remember it being his attitude I was drawn to the most. I sometimes wonder who I would of become without him, as it was his music that finally gave me the confidence to find my voice, to stand up for myself, and I haven't looked back since. When I found out about the interview for CMW, how could I resist? So I booked the day off work, bought my ticket and waited for the day to arrive. Thanks to the power of Facebook and me letting all my friends know what I was up too, a couple girlfriends purchased tickets to come too. Jenn and I went down bright and early as we didn't really know what to expect. I'm glad we did though. We picked up our pre-purchased tickets and we're lucky enough to be fourth in line. The girl ahead of us, Karen, was nice enough to hold our spots while we went out to get some breakfast and then came back for the long wait to get in. The time actually passed quite quickly with all the chatting and joking with the people in line. An old friend of Rob's, Stacie, was first in line and recognized me from Facebook, small world! We all scored awesome seats, most of my group taking a front row seat, while I chose to take a second row center isle seat, which put me right in his eye line. Q107's Jeff Woods talked to Nikki about a little of everything; Girls, Facebook, his kids, music, and of course his new book and album. It was really interesting to hear him talk about all the topics he spoke of, but the one that I found most interesting was the new era of technology. When he first started playing and I first started going to concerts, IPhones and digital cameras didn't even exist! He spoke about looking out into a sea of people now and seeing them taking videos of the show and pictures and basically watching it through a lens. He said he understands why people do it, but sometimes he wants to stop the show, and ask them to "be in the moment" instead of watching it. I so get this, as I say this to Rob all the time when we're out birding! Yes, I can even manage to bring birding into this blog post! LOL!! OK, back to Nikki, his words really moved me, as I get what he is saying, and in this age of e-mail, text, and Skype, he hoped, as do I, that we don't lose the need or desire for human contact. It's easier for fans today to feel "close" to their idols, they can follow them on Twitter and be "friends" with them on Facebook, and I do both with Nikki, but nothing makes you feel closer to them, then knowing you have something in common with them. It's been many years since I've been a teenager, but I've continued to follow Nikki's life and career with interest, and now know about the battles this man has fought and won. He thinks he's a better man for it, I agree, and it makes it easy for me to still idolize him, and I do. The man has a beautiful smile. I like this one cause he's looking right at me! I got this shot as he was leaving, no zoom needed.